After dining at Oyamel and Zaytinya over the past few months, I figured that it was time to try out Jaleo (named after the John Singer Sargent painting), the restaurant that started it all for José Andrés. 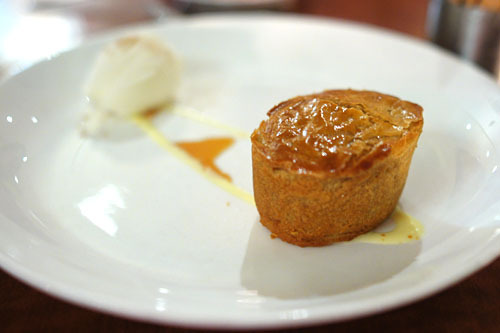 Following his graduation from the Escola de Restauracio I Hostalatge de Barcelona in 1990, Andrés moved to the US to work at the Barcelona-based Eldorado Petit. His tenure there didn't last long however, and in 1993, the Chef relocated to Washington DC, becoming head chef and partner at Jaleo, marking the beginning of Andrés' culinary empire building. Shortly thereafter, in 1995, he became the executive chef at Roberto Alvarez's nearby Café Atlantico, and in 2001, Andrés opened another Jaleo in Bethesda. 2002 saw the founding of Zaytinya, while Minibar was added to Café Atlantico the following year. 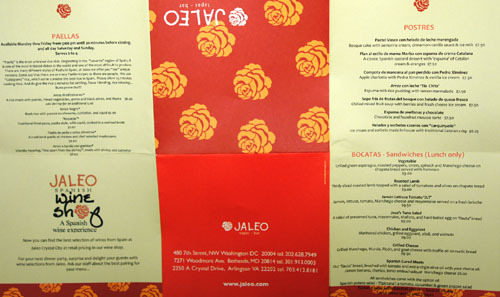 The original Crystal City location of Andrés' Mexican eatery Oyamel came to fruition in 2004, as did the third installment of Jaleo, in Crystal City. Oyamel eventually shuttered in 2006, only to reopen in Washington proper in 2007. 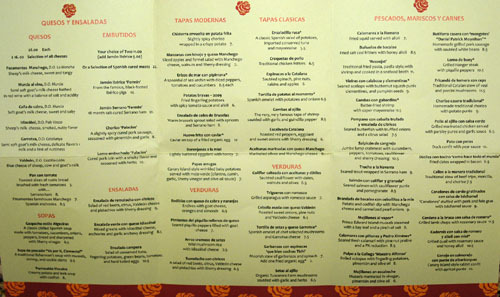 Then, of course, in 2008, we Angelenos were blessed with Saam/The Bazaar, Andrés' first venture outside of the DC metro. To head the kitchens at Jaleo, Andrés has tapped Bolivian native Rodolfo Guzman. After working in the Bolivian Navy, Guzman emigrated to the US in 1992 at age 23, settling in Washington DC. It was at this time where he began his culinary career, working his way up from the bottom as a busboy, food runner, waiter, bartender, pastry chef, and line cook at a variety of restaurants including Maggiano’s Little Italy, the casual Tex-Mex eatery Austin Grill, Brazilian restaurant Coco Loco, Cashion’s Eat Place, Sam & Harry’s steakhouse, and Café Atlantico. The Chef's formal training took place at L'Academie de Cuisine in Maryland, and in 1998, Guzman even travelled to Spain to work at the legendary elBulli. Afterwards, he became Sous Chef at Jaleo, under Wayne Combs, and in 2001, he was made Executive Chef. In 2005, Guzman temporarily relocated to the Crystal City Jaleo, where he oversaw the restaurant's opening before moving back to Downtown in January 2007. The term jaleo means merriment, revelry, gaiety, and also refers to a gypsy dance called the Jaleo de Jerez, so it's no surprise that Jaleo's decor aims to reflect that verve, vigor, and vitality. 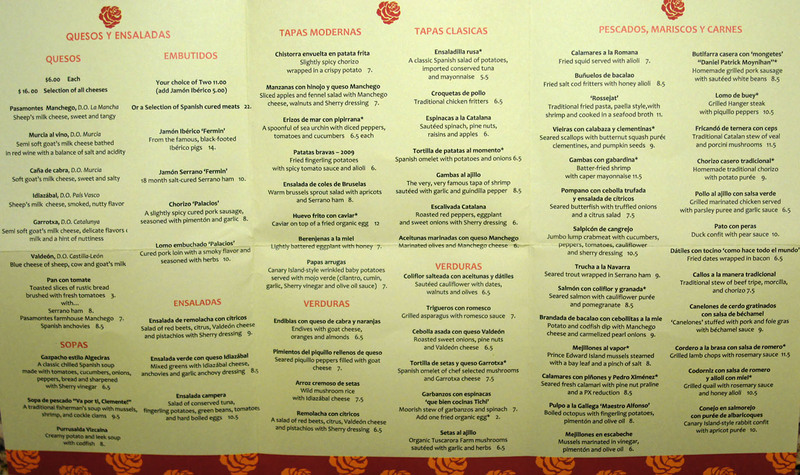 Jaleo's menu offers up a wide array of tapas, mostly traditional, but with a few modern ones mixed in as well for good measure. Paellas might also be worth considering. Click for larger versions. Our table wasn't quite ready when we arrived, so we headed over to the bar, where I ordered up a Yuengling [$5.50], a lager from Pennsylvania that I don't see all that often here on the West coast. Interestingly, it's also one of Barack Obama's preferred brews, and the President recently delivered a case of it to Canadian Prime Minister Stephen Harper after the American hockey team lost to the Canucks in the 2010 Winter Olympics final! 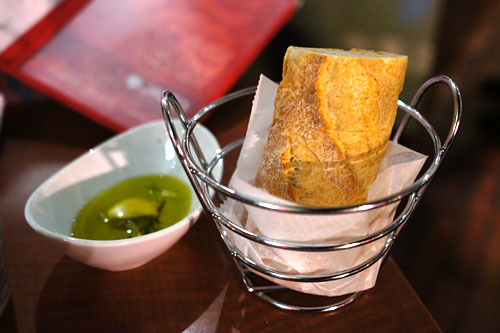 Bread was accompanied by olive oil with rosemary and garlic. 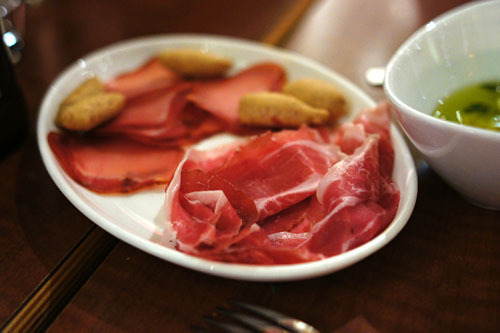 We began with a duo of cured meats. First up was the Jamón Ibérico 'Fermin,' from Embutidos y Jamones Fermín, the first producer approved to export the ham to the US. As expected, the meat was soft, delicate, almost buttery in consistency, with an intense, rich, smooth yet savory flavor and a hint of sweetness. We also had the lomo embuchado 'Palacios,' a type of herb-seasoned, dry-cured pork loin (analogous to cecina). More in-your-face than the Ibérico, it possessed a delightfully smoky sapor, with lovely spicy notes as well; I actually preffered it to the ham. I was a bit wary of this dish at first, but it turned out to be one of the stars of the meal. 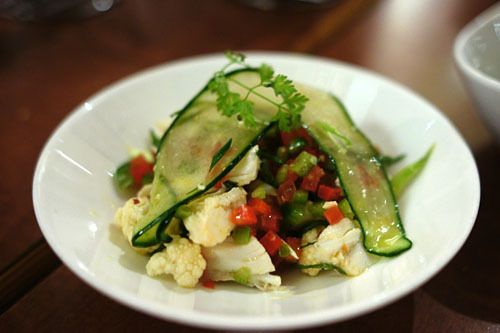 The mélange of vegetables, with their disparate tastes and textures all bound together by the tart sherry dressing, was a surprisingly fitting complement to the supple, slightly sweet crab, and I especially appreciated the textural element contributed by the cauliflower. By this point, Andrés' chicken croquettes are old hat to me, so I was positively intrigued when I saw this jamón Ibérico version. 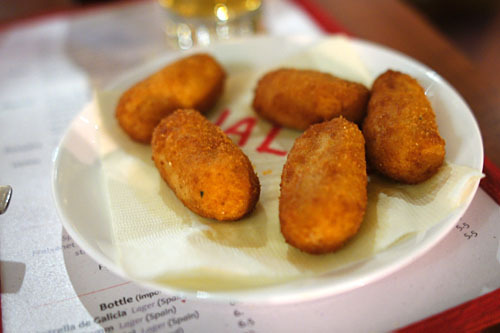 As expected, the croquetas were suitably creamy, as well as slightly fibruous, with a flavor that was imbued with the very essence of the salty, savory ham. With my Yuengling dispensed with, I went with another beer, this time the Estrella Damm Lager [$6.50] from Spain. 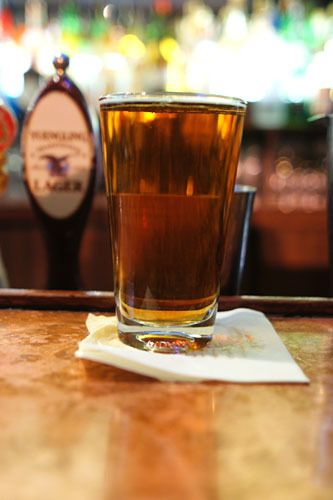 It was a light, easy-drinking brew--nothing offensive, nothing particularly memorable either. I'm quite a fan of the spinach, so I was looking forward to this one. The vegetable's signature astringency was present, but rather than taking center stage as it normally does, the bitterness was more of a backdrop for the sugariness of the fruit. The flavors here were slightly discordant, but strangely satisfying. Here we had some "wrinkled potatoes," basically tiny taters cooked in salt water and served whole. The papas were wonderfully salty alone, but they were perfectly paired with the included mojo verde sauce. The interplay between the relatively tame potato and zesty mojo was simply stupendous. 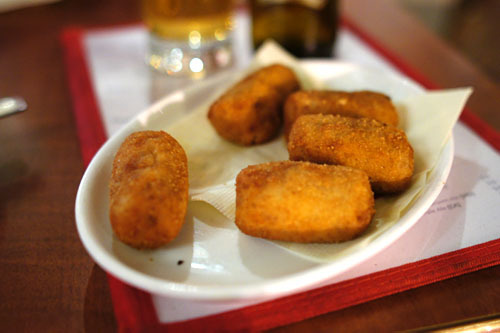 Once a staple of José Andrés' childhood, these croquetas de pollo are now a staple at his restaurants. I'd had them before at The Bazaar, so I knew exactly what to expect from these fritters: beautifully crisp, golden brown exteriors leading to luscious, oozing centers of béchamel and chicken, chockablock with the rich flavor of the bird. 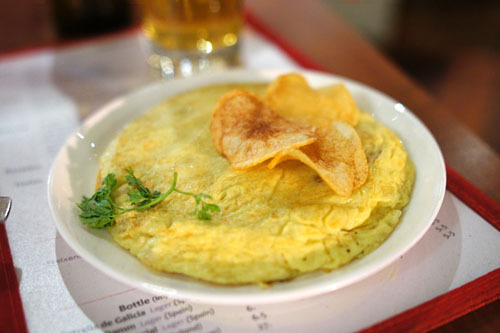 You can't go wrong with a tortilla de patatas, perhaps the most famous tapa of them all--basically a pancake of fried egg, onions, and potato. The ingredients may be elementary, but the end result is oh so pleasing: a creamy, soft amalgam of fluffy egg, crisp onion, and savory sautéed potato--fantastically eggy, delightfully salty. 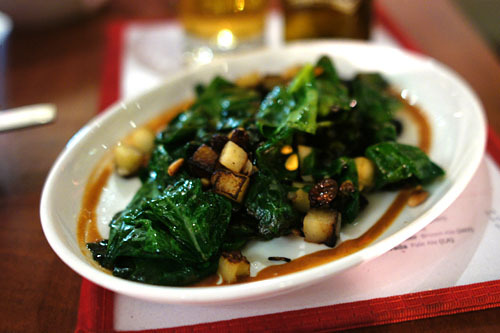 Jaleo's version, apparently, was inspired by the late Jean-Louis Palladin, one of the pioneers of French cooking in the US. 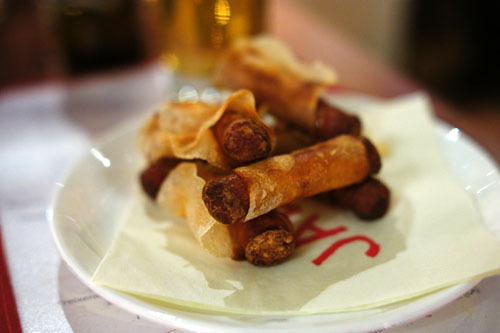 Chistorra refers to a variety of spicy Basque sausage, typically made with minced pork. Quite delicious on their own, the sausages also went nicely with the relative mildness of the potato crisps, which also provided a great textural element. I appreciate a tender octopus, but the example here was too tender for me--I would've appreciated a bit more bite. 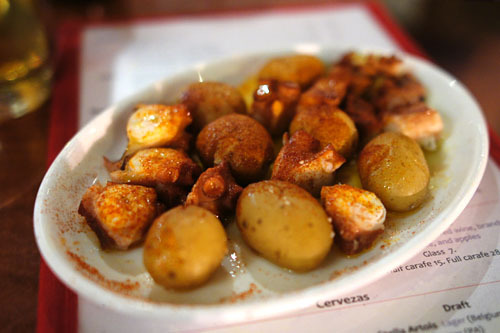 Flavor-wise, the cephalopod showed plenty of its characteristic briny sweetness, countered here by the spicy-smoky nature of the pimentón and weight of the olive oil. The fingerlings, meanwhile, provided a much needed temper. 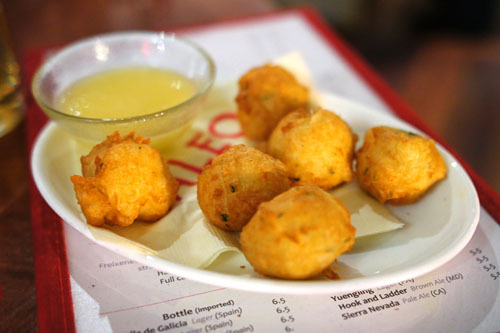 Ever since having bacalao at The Bazaar, I've become somewhat enamored with these salty balls of cod. The examples here were good, but not great; I could've used more brine, and would've liked a lighter, fluffier consistency. The main issue for me, though, was the paired alioli, which was far too saccharine, completely overwhelming the fish's natural sapor. Done medium rare, this was simply a beautifully cooked piece of meat: tender, succulent, and brimming with ovine sapor, with the slight gaminess of the meat perfectly balanced by the rosemary. 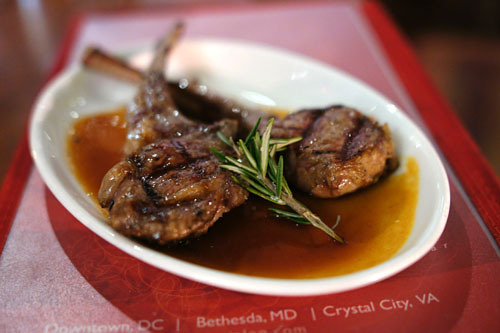 One of my dining companions, who was previously not a fan of lamb, even commented on how much he liked this dish. For my final libation, I chose the José Andrés Gin & Tonic [$14], scented with lemon and juniper. 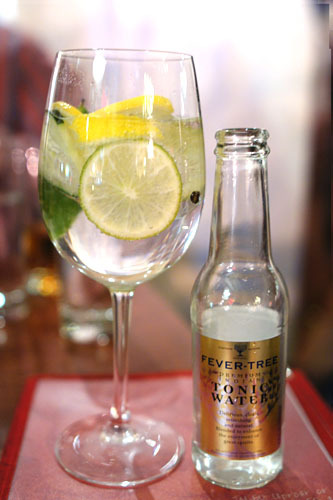 It was a refreshing twist on the standard G&T, with the use of juniper berry heightening the sharp, citrus-y character of the gin. Pastel Vasco typically refers to a Basque "poundcake," usually with some sort of berry component. The version here, however, was stuffed with a lovely, not-too-sweet semolina ice cream, and the whole amalgam was paired with the contrasting character of the ice milk and cinnamon-vanilla. 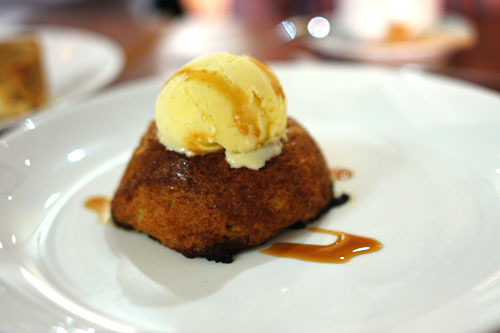 We ended with a variation on the ever-popular pain perdu. Made with applesauce, the cake was quite sugary, heavy even, and so the comparatively light vanilla ice cream was absolutely key. A classic combination, really. 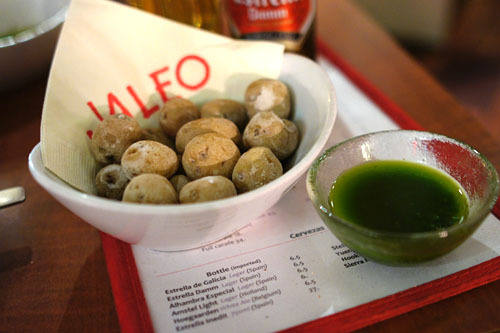 The food at Jaleo doesn't possess the playfulness, vagary, or whimsy of that at The Bazaar, but I'm still convinced that this is a fine place to get your tapas fix in the DC area. A couple of the dishes needed work I thought, but for straightforward Spanish, a visit to José's original just might be in order--I wouldn't mind coming back for more. Looks tasty though you're right--the plates at the Bazaar definitely look more playful! Looks like some tasty (and pricey) upscale tapas with a baller gin and tonic to top it off. Thanks for sharing. I came here too when I was in DC. Had a good meal, but it was short of being revelatory. Like Anna noted, it's pricey, yet to me failed to provide like Bazaar does. Where, in your opinion, does Bazaar stand among Jose Andres' DC establishments in terms of quality and overall experience? Either way, I love the authentic approach among his restaurants. Hope you get a chance to hit up VOLT or minibar while you're out in the DC area...VOLT especially is supposed to be amazing, but I heard it's damn hard to get a rez. Christina: Definitely. Bazaar definitely takes things up a notch, and is probably near the cutting edge when it comes to tapas. Anna: That's a fair statement, especially concerning that G&T (which was damn good, BTW!). Fiona: Bazaar is a bit more expensive though, right? Josh: It'd probably be like this: Minibar, Saam, Zaytinya, Bazaar, Cafe Atlantico, Jaleo, Oyamel. Anon: I really want to try out Volt, but if I'm going to do it, I'd want Table 21, which is booked up for months. MMMM Spanish food!! 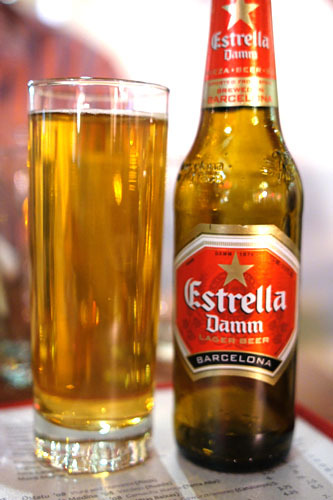 Estrella damm beer was so expensive!! 1'70 € here! !